.. Where? 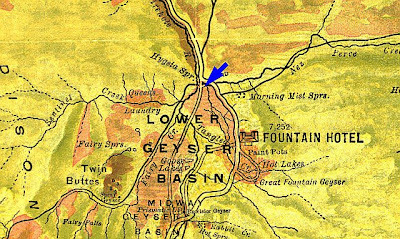 Nez Perce Creek, Firehole River, Madison River, Grayling Creek canyon, Gibbon River, (Tuff Cliff,) etc. 'Tis the season. Pick a warm evening and enjoy. .. Gallatin River? Probably next week. But there's still good action under water. .. The popular story goes something like this: "After seeing the wonders of the region, the campfire talk in the meadow produced a sentiment - to wit - that all this should be preserved for the American People." And thus was born Yellowstone National Park. .. Would that it was that simple and noble. Would that there was no politics and railroads, and local priorities in the mix. .. Ahhh - would that the accounts written in the twilight of life were less self serving and grandiose. But then again, that story would be too complex for tour guides, seasonal interpreters, and their visitors. 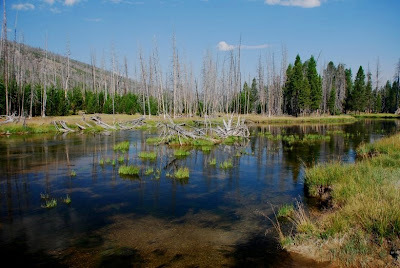 .. Should you care to explore the convoluted events that led to the finalization of a "National Park" there is an online book that will give you a start toward unraveling the cloudy events that did produce Yellowstone National Park. 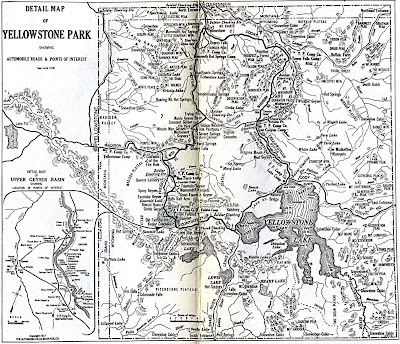 Read it HERE, Yellowstone National Park, Its Exploration and Establishment, by Aubrey L. Haines. .. For our purposes, it is sufficient to know that the Washburn-Langford-Doane Expedition camped hereabouts in the terminal stages of their journey through wonderland. And for our purposes the fishing is better, now than then, because of the introduced invasive species that inhabit these waters. .. 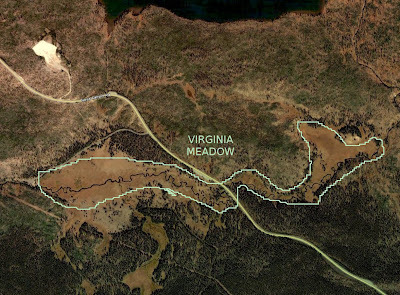 The popularly conceived National Park Meadow is, in fact, a series of segmented meadows along the Madison River, Gibbon River, and a short bit of the Firehole River. .. 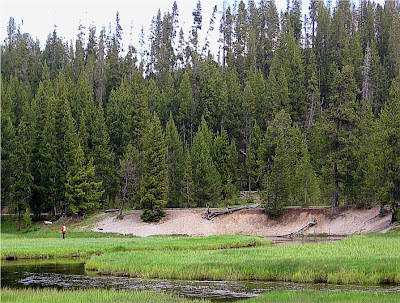 The vegetation, and character of the meadows, (both above the water and below,) is influenced by the varied sediments derived from the many geologic deposits in this region. The soils developed on these diverse sediments are different - as is each vegetation community. .. This river confluence and the course of the rivers is controlled and constrained by both the clastic and hard rock formations carved and re-carved by glaciers and floods. So what - you say? .. Boulders, cobbles, silt, sand, clay, and vegetation communities determine to a greater, or lessor extent what bugs inhabit the water. 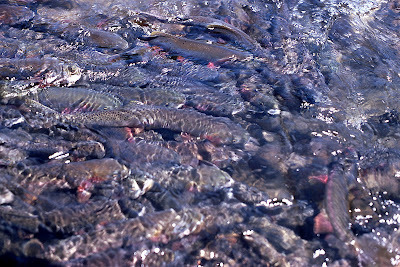 This, of course, influences the population of fish. If this is boring just go to the sidebar and find a river report. .. The Junction Pool, in local parlance, is a dynamic bit of water that changes annually depending on the runoff from two rivers. .. In fact there have been several different junction pools in the last 40 years that we are familiar with. 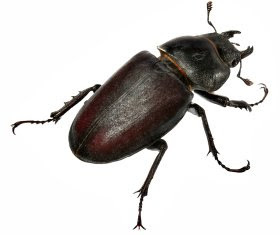 It is currently surrounded by a beetle factory. 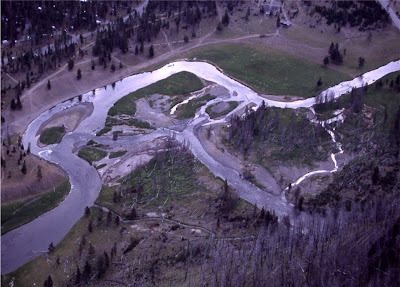 .. Sediments in both the suspended load and bed load from two distinctly different river basins join at this confluence and are mixed in the infant Madison River. .. Their downstream dispersion & distribution create a series of micro habitats far more complex that the simple phraseology known to most fisher folk. .. Terms such as Nine Mile Hole, Big Bend, Muleshoe Bend, Barns Holes, etc. are wonderful descriptions of physical features. .. They do not reveal, however, the character of the subsurface ecology. They offer little insight into the reasons why high runoff causes one sort of fishing in August and low runoff produces a different sort of fishing in August. .. We constantly hear visiting fisher folk remark that; "I've fished in this same spot for 10 years and now there are no fish this year!" .. My, my - how usual. For instance it's a local secret that Nine-Mile Hole has about filled up and moved way downstream. Fish there if you must - it's a bit of historical nostalgia. .. These rivers are dynamic entities. The old books and reports are interesting history; burdened with the same lore and value as the accounts of explorers written 30 years after their adventures. .. Most fisher folk are creatures of habit and history. We become joined at the hip with our favorite spot on our favorite water. We are stubborn and trapped in the myth and lore of history. .. We are often disappointed - yet buoyed by the experience of failure. We speak of luck, hatches, capricious fish and evil omens. .. We seldom speak of silt, substrate, nutrients, or runoff. We speak of presentation, drift, fly selection, and technique. We seldom speak of change, river stage, opacity, or segmentation. .. 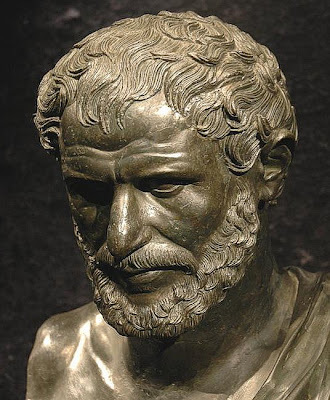 Despite what Heraclitus said to us around 500 B.C. most of us still think that we can fish in the same river twice. .. A few appreciate the changes. A few are sleuths of the river. A few delve into the mysteries of daily and seasonal and annual change. Some even enjoy the challenge of the unknown. Most, however, just want to know what fly is working. .. This season, as you read this, the Gibbon River portion of National Park Meadow is fishing better than it has in the last 6 or 7 years. Hatches are persistent, bugs are present, and fishers are sparse because of the local knowledge based on the weight of history. "It looks good but there are no fish there," - so be it. .. The Madison River section, (down to about Big Bend,) is a bit devoid of the usual dimples, splashes, and stories. 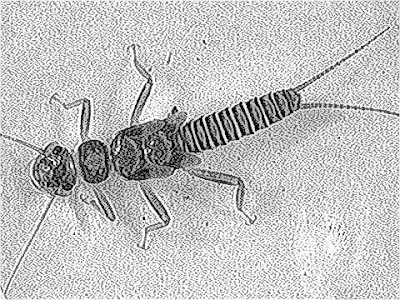 However beetles and ants, (surface and subsurface,) are regularly taking fish. This is a good 5 weeks before "they're supposed to be there," - so be it. .. We're going to explore the 'way-upper' Gibbon River and Virginia Creek. Haven't seen an expert there in years. .. 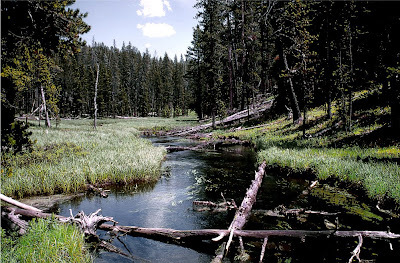 When people mention the meadows on the Gibbon River they generally mean either Elk Park or Gibbon Meadow. That's just fine with us - it reduces the elbow count on other, smaller meadows, containing many eager fish. .. We're not sure of the official names of these meadows so we've included maps with "local place names." .. These upper Gibbon River meadows are providing excellent catching right now. .. The most willing of the fish are the resident Brook Trout and the section around Norris Campground is considered a children's fishery. 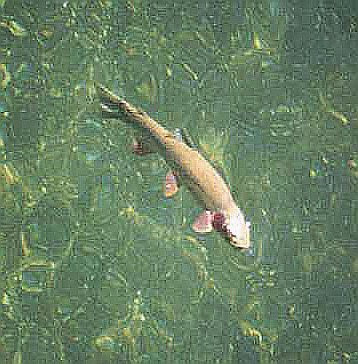 Early morning and late evening fishing holds the promise of good-sized Rainbow Trout and the possibility of a Grayling. .. Upstream, (south,) of the Norris to Canyon Road the water is thin and clear. This is water that requires a bit of stealth to take the 6" - 10" monsters. These fish are not particularly selective in their fly sucking - but they are spooky. You will see many fish darting away if you charge up to the stream bank. There are both scattered trees, and large bison here so be very alert and cautious in your sneaking. .. 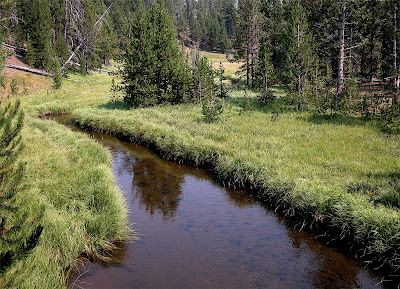 The trail along the river to Solfatara Meadow is gentle and well worn. This trail is popular with the campers at Norris Campground. The fish in this section of Solfatara Creek are definitely smaller. .. Many are juvenile and this is primarily a nursery fishery. It's best to sight-fish for the larger residents, (up to 9".) 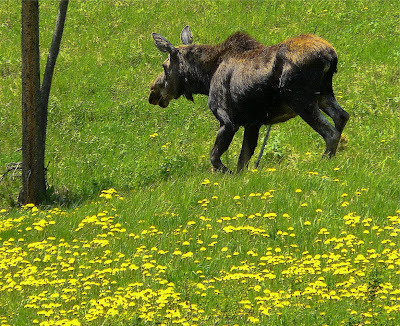 They can be seen and will pose for you if you are stalking in the afternoon with the sun at your back. 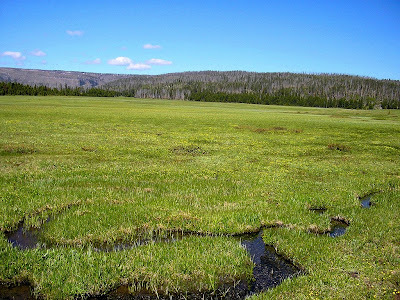 .. One of the most catcher-friendly meadows in all of Yellowstone National Park is Virginia Meadow. For some reason this beautiful meadow is often ignored by seasoned fishers. It is also considered a children's fishery. The grass is tall, the Gibbon River is gentle and at grade. the fish are willing and can be surprisingly selective. .. This clear water can treat you to the surprising vision of an 8" trout following your fly and rejecting it time and again. .. 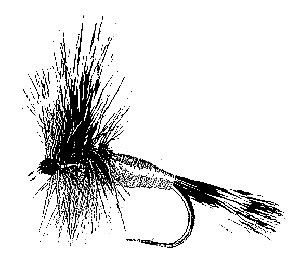 Same fish - different fly - another rejection. It's a ballet of frustrating magnitude in its gentle beauty and snobbery. .. There is no discernible reason for this selectivity. Hatch or no hatch; the ballet can be present. Flies that were just plain "KILLER" a dozen steps away are often rejected. .. 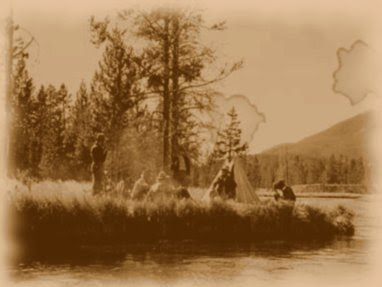 The humor and entertainment value of this sort of fishing must be appreciated if you intend to venture into this meadow. .. Access is usually easy from the generous parking area at the eastern end of the Virginia Cascade Road. This one-way road is narrow and has suffered numerous collapses and landslides in the last 10 years. There are many pedestrians and most of them have children of the "don't-look-before-running-into-the-middle-of-the-road" variety. Please drive slowly and carefully. No RV's are allowed. .. 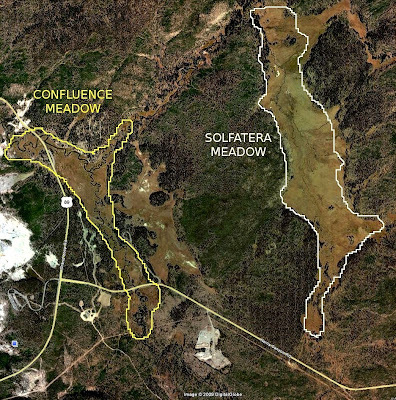 This meadow continues north of the Norris to Canyon Road. 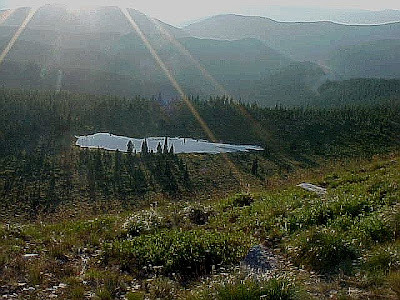 This is also the trail to Grebe Lake, and other interesting destinations. 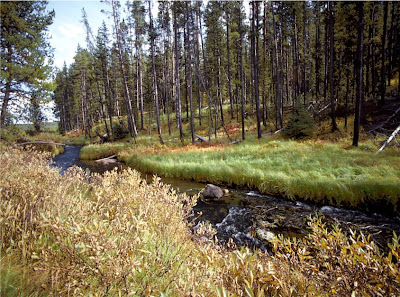 This river segment offers the best chance for catching one of Yellowstone's adfluvial Grayling. These shy, opalescent ghosts reside here after abandoning their home in Grebe Lake. 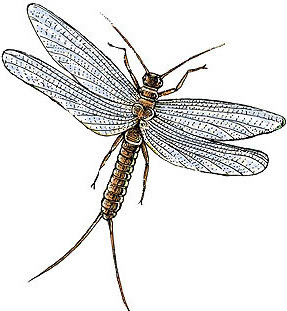 They are primarily water-column feeders but they will actively chase small surface flies in the early mornings and evenings. .. This upstream portion of the meadow is very often the stomping ground of black bears and bison. It seems to be a way point on their travels. Be extra alert as you fish the upstream end near the trees. .. What flies? Generally just about anything in your box. 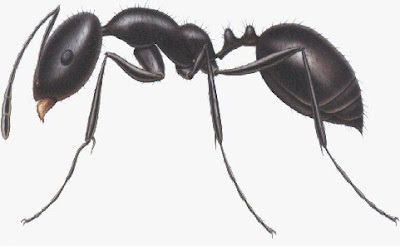 Royal Humpies to ants and beetles will usually work. There are some hatches that the trout will key on. But the size seems to be a bit more important than the pattern. 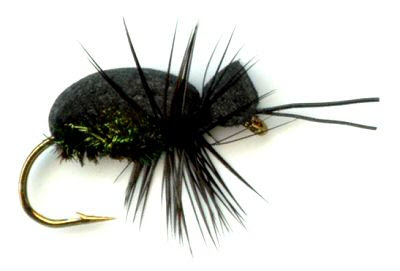 Carry some small mayflies and caddis imitations along with your attractors and nymphs. One box should do it - travel light for your venture into these emerald meadows. .. It's early and the relatives want to catch some fish. Maybe we won't be delayed too long at the signals in the canyon section. .. We have received several requests to reveal the secrets and intricacies of The Notellum River. For those who missed the post yesterday, or the one last August -- Here it is. This is the most that we can say and still live in the neighborhood. .. 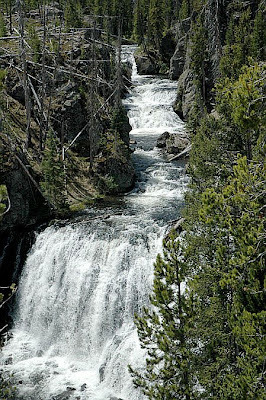 It looks like everyone wants to fish the Firehole River right now. Join the crowds and enjoy the weather. For the most part the rainy (and sometimes snowy) weather thus far in June has kept the hatches rolling on the Firehole. Like the bugs and feeding fish, fisherfolk have been (and still are) plentiful. Flows have settled quite a bit over the past 2 days (412 cfs in the canyon this morning with today’s average flow 348 cfs); the water is warming enough that some of the regulars have been wading wet during these recent warming afternoons. (This is one of my favorite rivers to wade wet; you can through October in most years). Mid-day fishing is beginning to slow just a bit as we ease into more of a true summer pattern this week; it was warm yesterday and will be even warmer today. There are still mayflies coming off, though the late afternoon – early evening Caddis will become more and more important as we nearer and nearer to June. Our wet June has kept the Firehole River cool and happily spitting out insects for the trout to feast on. Mid-day fishing has slowed a bit, but there are still good opportunities for surface fishing in the mornings and evenings. Caddis emergence has become very important to the trout so give this a try when rising trout ignore conventional dead drifts: place CDC Caddis or Swing Caddis just under the surface, it can be deadly. 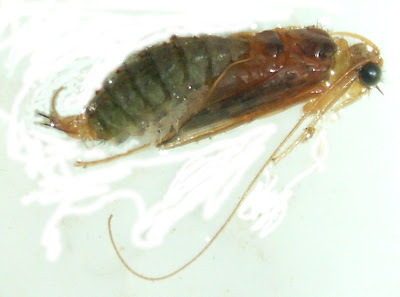 Spent Caddis are excellent flies when Caddisflies are laying eggs. .. On the other hand, The most eager trout in the park haven't seen a rod in a week. The NPS campsite in the middle of the meadow shown below has had no takers for 10 days. It's less than an hour's easy walk from the trailhead. Maybe it should be fished. .. And, of course there's Notellum River. It's cold. It's clear. It's thin. It has more fish than can be told. It's experiencing no fishing pressure. And it's less than 20 minutes from the road. 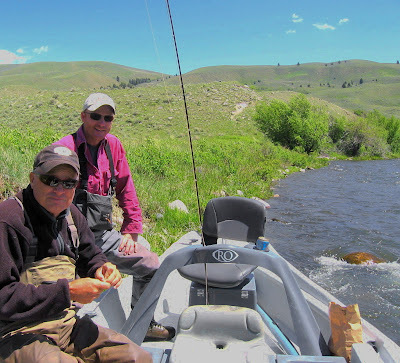 .. Constrain your activities to just fishing, (let alone catching,) and you miss a bit of the flavor and personality of Yellowstone National Park. .. As our nation's first park there is history lurking at every beat and run of most rivers. .. 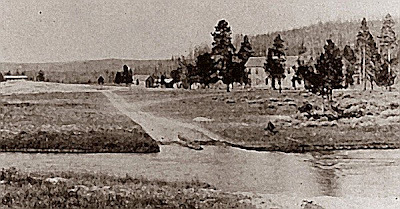 If you've enjoyed a dalliance on the Firehole River or if you've bothered to stroll Nez Perce Creek, you've trod the ground where Chief Joseph did. You've also wandered in the footsteps of early visitors who stayed at the Marshall Hotel. .. The hotel started out as a crude affair. A simple cabin that apparently was never completed. .. The second Marshall Hotel was not much better but was at least two stories tall and had wooden, (instead of canvass,) walls. 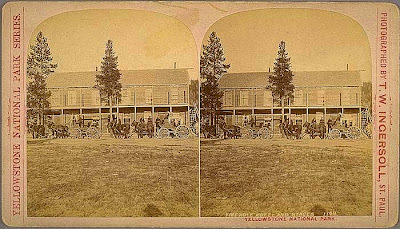 The later structure and it's associated ramshackle buildings was also known as the Firehole Hotel. .. 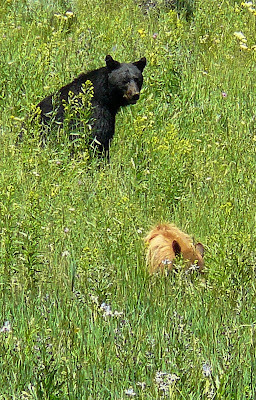 The compund was the only one in the interior of the park for years. The helter-skelter assortment of buildings was a portent of future development in a park that pretends to be wilderness. .. The modern road construction in the early 20th century destroyed what little was left of the buildings and the site. If you've driven to the barrier on the Freight Road you've driven over the old hotel. 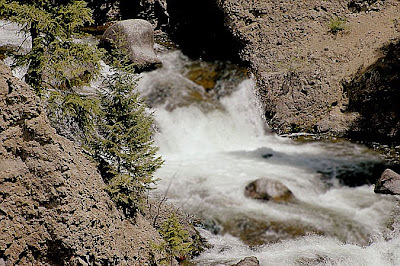 It sat at the confluence of Nez Perce Creek and the Firehole River. .. Guests at the hotel could not fish. There were no fish! .. Stocking of invasive species on this bit of park waters first took place in 1889, (just two years before the hotel was abandoned in favor of the Fountain Hotel - a bit further south.) The Army used a few of the crude structures until about the second decade of the 20th century. .. If you just fish - forget it. 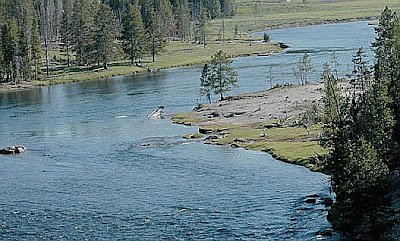 The Firehole River and it's artificial fishery is now a world wide commercial attraction. .. Speaking of catching: it's pretty good right now, (and getting to be that way on Nez Perce Creek as well.) Today the streams are dotted with waders, (wearing waders.) and dodging the bison. 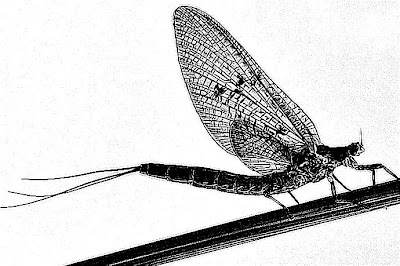 .. Today the mayflies, whose natural history has been forever altered by the fish, are hatching. Today the caddis flies, who have dodged fish ever since, will bloom voluminously from late afternoon to twilight. .. Fishing guides in the neighborhood have precious few days off during the visitor season. .. Some play golf, some stay home with the family, some sleep and recuperate, and some go fishing. .. It's an honor to be the fifth, (odd-man-out,) on a busman's holiday. Four of the region's top guides, (& yours truly,) visited the Madison River last weekend. .. Two drift boats leapfrogged down the river testing currents, drift lines, fish distribution, water clarity, water depth, and a myriad other factors that go into guiding on the world's longest riffle. .. A combined total of over 110 years experience, (we don't count,) was represented in the flotilla. .. An assortment of flies and techniques was tested: weight, - no weight, bobbers - no bobbers, dry, - wet, - nymph, - streamer, - single, - double, - dead drift, - swing, - and so forth, were explored. .. Fly preference and depth of take were observed. Rigs were adjusted. Tippets were lengthened and shortened: strengthened and lightened. .. Insights, speculations, observations, and conclusions were shared and compared. .. The pros called it research - we called it a damn fine experience. They demanded we participate. .. They insisted on fixing our rig. They changed the flies. They adjusted the leader and tippet. They untangled the snarls. They retied everything and did it in the blink of an eye. They still have teeth! .. They picked us up at our door and delivered us back there. They bought us lunch and adult beverages. They showed us the intricacies of the river and it's personality. .. They walked the boat through the choice runs. They beached the boat for embarking and disembarking, and we didn't even get a toe wet - how fine is that! .. For early season fishing it was a banner day. It wasn't perfect: the sun and clouds were spectacular. The wind, (always there,) was blowing a gale, but at least it was blowing downstream. .. The caddis were late and there were no noticeable mayflies on the surface. The swallows were generally cruising high and only occasionally dipping to water level. But all the detriments were overcome by the knowledge gained by having fished this river for a lifetime. 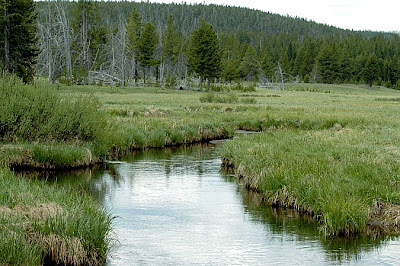 .. We get this opportunity to visit the lowland Madison River only a few times per year. Each time is a cherished memory. It's work as hard as any for the guides. It's as good as it gets for us. .. We can only reveal the common flies that worked, (and there were many.) 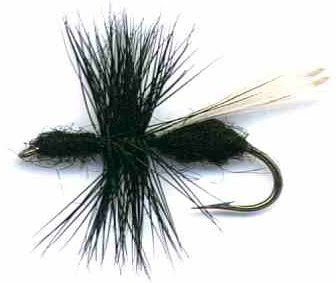 We've been sworn to secrecy about the "guide flies" but we can use them if we ever get that way again. .. Subsurface with a bobber and two flies was the most successful catching rig of the day. .. Size, (on this occasion,) did not seem to matter. 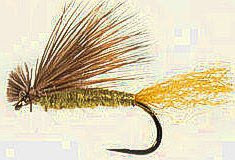 The second most successful two fly combination was Rubberlegs Grub and olive Serendipity, (size 4 followed by size 16.) Fish took them both. 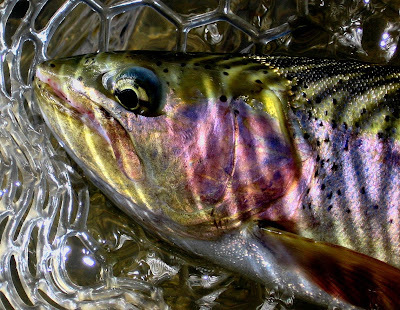 Egg patterns and two-toned pink San Juan Worms came in a close third. First place is a closely guarded secret. .. On the surface small Iris Caddis and various X-Caddis variants were the ticket. It was a ticket to the cheap seats, however, since the fish on this day were not seeing much above them. The river is still high and has a bit of color. .. Yet, the old adage, "Fish Got'ta Eat" holds true. That's what was discovered and explored. It was discovered quickly and fishing rapidly turned to catching. .. Changes in flies and combinations served to verify the research. There was nothing random about it. It was methodical, studied and informed: that's what intimacy with a river and it's fish is all about. .. These folks are our neighbors. We get to visit with them infrequently during this time of year. They work hard and deserve our heartfelt appreciation and thanks. Thanks guys! .. P.S. all images are huge. Click on them to see. Use them as you choose, citation is always appreciated. 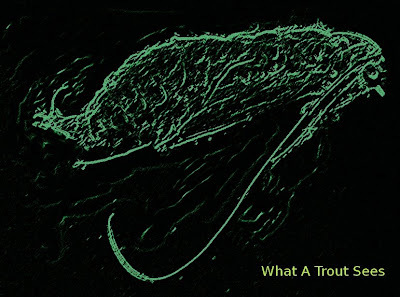 Caddis - - - Where?